The NVIDIA CUDA Random Number Generation library (cuRAND) delivers high performance GPU-accelerated random number generation (RNG). The cuRAND library delivers high quality random numbers 8x faster using hundreds of processor cores available in NVIDIA GPUs. cuRAND also provides two flexible interfaces, allowing you to generate random numbers in bulk from host code running on the CPU or from within your CUDA functions/kernels running on the GPU. A variety of RNG algorithms and distribution options means you can select the best solution for your needs. The random number generators and statistical distributions provided in the cuRAND library have been tested against well-known statistical test batteries, including TestUO1. Please see the cuRAND documentation for selected test results. 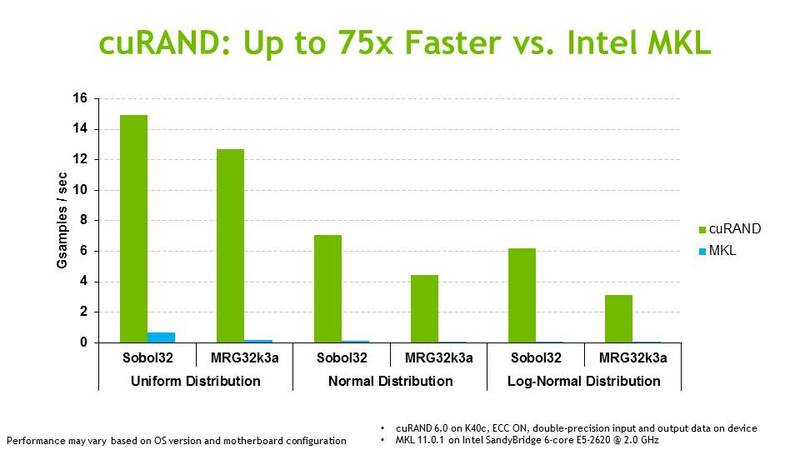 Review the latest CUDA performance report to learn how much you could accelerate your code. The cuRAND library is freely available as part of the CUDA Toolkit at www.nvidia.com/getcuda.